LONDON, January 28 (IslamOnline & Al-Quds Press) – Renowned Islamic scholar Sheikh Youssef Al-Qaradawi said Monday, January 27, that anybody killed in a military operation aimed at expelling American occupation forces from the Gulf is a martyr due to his good intention. However, Al-Qaradawi stressed that a difference should be struck between American civilians and its government and military which are nothing more than a colonizing force and enemy stepping into the land of Muslims without their own agreement. “Those killed fighting the American forces are martyrs given their good intentions since they consider these invading troops an enemy within their territories but without their will,” Al-Qaradawi, a widely-respected Egyptian-born cleric based in Qatar, said in an interview with Al-Quds Press Agency Monday. But the Islamic scholar stopped short of calling for fighting the U.S. army, in what seems to be a concerted effort not to trigger a clash of the Arab nations with their governments as he repeatedly asserted before. The Muslim cleric pointed a finger at the United States for launching a fierce war against the Islam and its believers and showing an interest “to be a god worshipped away from Allah”. “The U.S administration wants to maintain a grip and keep an eye on everything in an attempt to be a god,” Al-Qaradawi repeated. In this perspective, we refuse, resist and disbelieve these invading power, he argued. As for the build-up of U.S. troops in the Arab Gulf region in preparation for a potential military offensive against Iraq, Al-Qaradawi slammed them as new “Tartars”, in reference to fierce war-like people that had attacked the Islamic empire in the 14th and 15th centuries. “The Tartars first appeared as a new military power in the world at the same time the Islamic world was teetering in weakness. 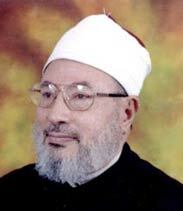 So all the Muslim areas were easy targets for them as they fell down one after the other,” Al-Qaradawi warned. In the interview, Al-Qaradawi was keen to stress a difference between the American people on the one hand and the U.S. administration and military arsenals on the other. He referred to war in the name of terrorism combat is now directed to Islam, as the attacks on the Islamic schools, charities, societies and personalities are meant to change the mentality of Muslims. In other words, they want a submissive, meek and mild character with no care about its own situation, Qaradawi explained. Al-Qaradawi lashed out at all efforts to change Islamic curriculums, saying they will solely lead to breeding hippies loyal to the western civilization. There are other attempts to get Muslims to forget such great characters as Khalid Ibn Al-Waleed and Salah Eddin Al-Qayoubi and Omar Al-Mukhtar from the chapters of out history, Al-Qaradawi lamented, referring to Islamic heroes. Al-Qaradawi was confident that all of these attempts would be doomed to failure.